Denver, Colorado’s The Lumineers released their eponymous debut album through Nashville’s Dualtone in 2012. The triple platinum album garnered two GRAMMY nominations and spawned the chart-topping platinum singles, “Ho Hey” and “Stubborn Love”. The band also served as Saturday Night Live’s musical guest on January 19, 2013. After years of touring the world in support of their debut album, the band released the follow up Cleopatra on Dualtone, in 2016. The platinum album debuted #1 on both Billboard’s Top 200 Albums Chart and the UK Albums Chart and featured the gold title track as well as the platinum single, “Ophelia”. The tour in support of Cleopatra included two sold out shows at Madison Square Garden and one at the Hollywood Bowl. The band has also supported two of their musical heroes, including opening up for Tom Petty and the Heartbreakers on his last tour as well as U2 on their “Joshua Tree Tour” in 2017. The band was also invited as guests to visit the Obama White House twice in 2016. The Lumineers are happy to share their moving music video for second single, “Cleopatra,” off hit second album of the same name, which tells the story of a woman named Manana from the Republic of Georgia. Directed by Isaac Ravishankara (Ellie Goulding, Hozier, Phantogram) the video for “Cleopatra” is the first of a series that tells the story of the album with the same name. To be presented in reverse-chronological order, we begin with Cleo as a divorced taxi driver – age 55. The video follows her through a day in her life as she gives rides to various passengers. With all the people she sees throughout the day, she can’t help but see herself in their lives… especially the last passenger she picks up – her son, having just returned home. The Lumineers appear in the video at 1:26 as Cleopatra sees them heading out of town at the airport. She knows she’s seen them before somewhere, or maybe just that she’ll see them again somewhere down the road. “Cleopatra was the bedrock of the album,” Wesley says of the tune. The singer and his wife came to know her through a friend. “She drives taxis and is this badass lady – she’ll pick you up at the airport with a cigarette hanging out her mouth and a beer can between her legs,” he says. You can check out the emotional video for ‘Cleopatra,’ here. Second single ‘Cleopatra’ has quickly gone to top 25 at AAA format following in the footsteps of hit single ‘Ophelia.’ ‘Ophelia’ has also since debuted on the Hot AC chart, following its record 13 week No. 1 run at AAA and four weeks No. 1 at Alternative. It was the band’s third single at Alternative to go No. 1. The band continues to sell plenty of albums and this week Cleopatra hits another milestone, joining Soundscan’s Top 10 rank of best selling Vinyl records of 2016 alongside Adele, David Bowie, the Beatles and Miles Davis, among others. The Cleopatra World Tour kicked off its first leg of US dates to rave reviews, with The Dallas Morning News raving, “It’s not unusual to hear fans singing along at concerts, but it’s a little more rare when a sold-out crowd can recite every song in a set.” The group has added several more North American tour dates, concluding with a show at the famed Hollywood Bowl venue in Los Angeles, California! Please see a full list of tour dates below. The Lumineers’ ‘Ophelia’ off second album, Cleopatra, is holding No. 1 for the 12th straight week at AAA radio format, joining the ranks of Coldplay, Jack Johnson & Dave Matthew Band with the third most consecutive weeks at #1 on the Mediabase AAA chart. Cleopatra is the first No. 1 Billboard charting album from an indie label this year (Dualtone, an Entertainment One Company), and is a major hit overseas with the album ringing up No. 1 sales in the UK, Canada, and South Africa to go along with the US top rank. The band is also trending No. 2 at Alternative radio, and rising quickly!In another recent milestone, the band’s songs reached a combined one billion streams on Pandora, in addition to the band selling over 200,000 tickets in advance of their U.S. tour thus far. The Cleopatra World Tour kicked off its first leg of US dates to rave reviews this past weekend with sold out plays in Dallas and Houston. The Dallas Morning News’ Blog raved, “It’s not unusual to hear fans singing along at concerts, but it’s a little more rare when a sold-out crowd can recite every song in a set. The Colorado folk band the Lumineers orchestrated this kind of enchanted evening at the Bomb Factory on Sunday night, filling the warehouse-like Deep Ellum space with passionate sing-alongs and the type of gusto you’d find at a late-night karaoke bar.” The group has added several more North American tour dates, concluding with a show at the famed Hollywood Bowl venue in Los Angeles, California! Please see additional tour dates below. Today The Lumineers shared their latest music video for the songs “Angela/Patience.” Directed by Isaac Ravishankara, the video is the third installment in a series by Ravishankara (Hozier, Polica, Phantogram), presented in reverse-chronological order that tells the story of ” Cleopatra” – both the main character in each video and the title of the band’s latest album. In this video we find Cleopatra in her early 20s, pregnant, presented with the duality of wanting to run and break free from obligations, yet being old enough to accept responsibility. Check out the moving video here. The Lumineers will be live-streaming their show on Thursday, September 15th in Cary, North Carolina. The stream can be viewed on Facebook via Live Nation TV’s page, Live Nation’s YouTube Channel and LiveNation.com starting at 8:55 pm EST. Earlier this summer, the band announced that 100% of proceeds from the show will go directly towards HRC and EqualityNC, to help fight the HB2 legislation. From lead singer Wesley Schultz, “…there’s no perfect way to protest this issue -we believe music is a way to bring all sorts of people together, and through that, encourage open-mindedness, love and acceptance. As the Cleopatra World Tour makes its stop in NC during such a controversial time we think it is important to invest in the people and organizations that will make the state a better place.” In addition to their generous donations, the band is also providing gender-neutral bathrooms an option at this show. The Lumineers have been touring in support of their recently released album Cleopatra. Second single ‘Cleopatra’ quickly went top 10 at the AAA format following in the footsteps of hit single ‘Ophelia.’ ‘Ophelia’ has also since debuted on the Hot AC chart, following its record 13 week No. 1 run at AAA and four weeks No. 1 at Alternative. It was the band’s third single at Alternative to go No. 1. To date, Ophelia is also the most played song in 2016 at the AAA and Alternative formats. LOS ANGELES,CA September 27, 2016 – Two time GRAMMY nominated artist, The Lumineers, announced last night during their performance on Jimmy Kimmel that they’ll be embarking on their first ever North American arena tour in 2017. This news comes just days after the act performed at the esteemed Americana Music Awards, and on the coattails of a current sold-out North American leg of the Cleopatra World Tour, that included shows at famed venues such as Hollywood Bowl, two nights at Greek Theater in Berkeley, two night at Red Rocks in Denver, and two nights at the Ascend Amphitheatre in Nashville. The Cleopatra World Tour will be produced and promoted by AEG Live & Messina Touring Group (MTG) and includes a stop at the iconic Madison Square Garden in New York City on February 2nd. The Lumineers will also perform at the White House October 3 as part of President Obama’s SXSLawn festival. ‘Cleopatra’, the band’s second single from their new album, has already gone top 5 at the Triple A format following in the footsteps of hit single ‘Ophelia.’ ‘Ophelia’ has also since debuted on the Hot AC chart, following its record 13 week No. 1 run at Triple A (2nd most played single ever at the format) and four weeks No. 1 at Alternative. It was the band’s third single at Alternative to go No. 1. To date, Ophelia is also the most played song in 2016 at the Triple A and Alternative formats. *Presales, public on-sales, and support acts vary by date, please check your local listings. Andrew Bird is an internationally acclaimed multi-instrumentalist, vocalist and songwriter who picked up his first violin at the age of four and spent his formative years soaking up classical repertoire completely by ear. As a teen Bird became interested in a variety of styles including early jazz, country blues and folk music, synthesizing them into his unique brand of pop. Bird has released 13 albums and played several hundred shows, both solo and with his band, headlining concerts at Carnegie Hall, Sydney Opera House, and festivals worldwide. In recent years he has composed his first film score for the movie Norman (hailed as “a probing, thoughtful score” by The New York Times), contributed to the soundtrack of The Muppets, and scored the FX series Baskets. He was a featured Ted Talk presenter and a New York Times Op-Ed contributor. Bird released his most recent studio album, Are You Serious, April 1st, 2016 on Loma Vista Recordings. SUSTO is a Charleston, SC based alt-rock/Americana band that was founded by Justin Osborne. The band’s music is heavily influenced by Osborne’s southern upbringing, along with his time living in Cuba. SUSTO has spent the past year touring extensively throughout the U.S., with notable 2016 dates including Stagecoach, AmericanaFest, and Austin City Limits. SUSTO’s new album & I’m Fine Todayis set to be released on Jan. 13, 2017. Messina Touring Group is a partner of AEG Live, one of the top live entertainment companies in the world. AEG Live is dedicated to all aspects of live contemporary music performances, including producing and promoting global and regional concert tours, music and special events, and world-renowned festivals. AEG Live operates in North America, Europe and Asia through 16 regional offices that support its tours which include such artists as Taylor Swift, Paul McCartney, The Rolling Stones, Justin Bieber, Katy Perry and Kenny Chesney; produce or support over 25 music festivals, including the iconic Coachella Valley Music & Arts Festival; and owns, manages or books more than 60 clubs and theaters. AEG Live presents more than 8,000 shows annually worldwide and conducts business under such globally renowned brands as AEG Live, Goldenvoice, Concerts West, Messina Touring Group, Marshall Arts LTD, and Madison House Presents. For more information visit www.aeglive.com. LOS ANGELES, CA November 14, 2016 –Due to overwhelming demand The Lumineers are adding a second show at Madison Square Garden on February 3. The announcement comes on the heals of tickets for their February 2 at the World’s Most Famous Arena being sold out in mere hours. Andrew Bird will support both shows. The band is also releasing the video for the song “Sleep On The Floor” today.The tale of Cleopatra, the character in the title song, being told in reverse-chronological order continues with Isaac Ravishankara’s latest video. Here we find her in her early 20s on a quintessential road trip adventure. You can watch the video here. The Lumineers, known for their emotional songwriting and live shows, released their second album, Cleopatra in April of 2016. It topped the Billboard album charts becoming the first album released on an indie (Dualtone, Entertainment One Company) to top the chart in 2016. “Cleopatra,” the band’s second single from the album, has already gone top 5 at the Triple A format, following in the footsteps of hit single “Ophelia.” “Ophelia” has also since debuted on the Hot AC chart, following its record 13 week No. 1 run at Triple A (the 2nd most played single ever at the format) and four weeks No. 1 at Alternative. It was the band’s third single at Alternative to go No. 1. To date, “Ophelia” is also the most played song in 2016 at both the Triple A and Alternative formats. The band’s self-titled debut album garnered the band two Grammy nominations include Best New Artist. It is certified double platinum in the United States with songs “Ho Hey” 6 times platinum, “Stubborn Love” platinum, and the song “Flowers In Your Hair” gold. Today the The Lumineers release their version of ‘Blue Christmas’, available on all major platforms via Dualtone Records, an Entertainment One Company. The rework of the Elvis Presley season classic sees the band in true holiday form, crafting their own sweetly-tinged yet distinctive take on one of the holiday’s most endearing anthems. Last night saw The Lumineers perform ‘Blue Christmas’ while partaking in one of the most exciting events of the holiday season, the prestigious 94th annual National Christmas Tree Lighting ceremony in President’s Park (White House). The show which also included Kelly Clarkson, Chance The Rapper, James Taylor and Garth Brooks will air December 5 at 7 p.m. ET/PT exclusively on Hallmark Channel through a partnership with the National Park Foundation, the official charity of America’s national parks. This notorious American Holiday tradition took place on the Ellipse at President’s Park and the special event wraps the National Park Service Centennial year and celebrates the launch of a second century of discovery and stewardship. You can visit www.thenationaltree.org for more information about the event and its history. This is the second time this year the band has made a stop at the White House. They were there in October for President Obama’s inaugural South by South Lawn festival. 2016 proved to be the year where The Lumineers threw away any suggestion of a sophomore slump. Their sophomore LP Cleopatra, released last April via Dualtone Records, (an Entertainment One company,) recently crossed the 500,000 mark in sales, and was fueled by the chart topping platinum single “Ophelia,” which according to Billboard, “… is the biggest rock radio single of 2016, ranking at No. 1 on the year-end Rock Airplay, Alternative Songs and Adult Alternative Songs charts. The album debuted at No. 1 on the Billboard 200 in April, besting the No. 2 peak of the act’s 2012 eponymous breakthrough. Other highlights of 2016 were a sold-out US tour, appearing twice at the White House and performing on The Tonight Show with Jimmy Fallon, Late Show with Steven Colbert, Jimmy Kimmel Live, Conan, and Good Morning America. The momentum from 2016 looks to be continuing on in 2017 where the band will be on their first-ever arena tour throughout the US. Tickets are selling briskly for the dates with the band recently adding a second night at the legendary Madison Square Garden after a first show was sold out in mere hours. 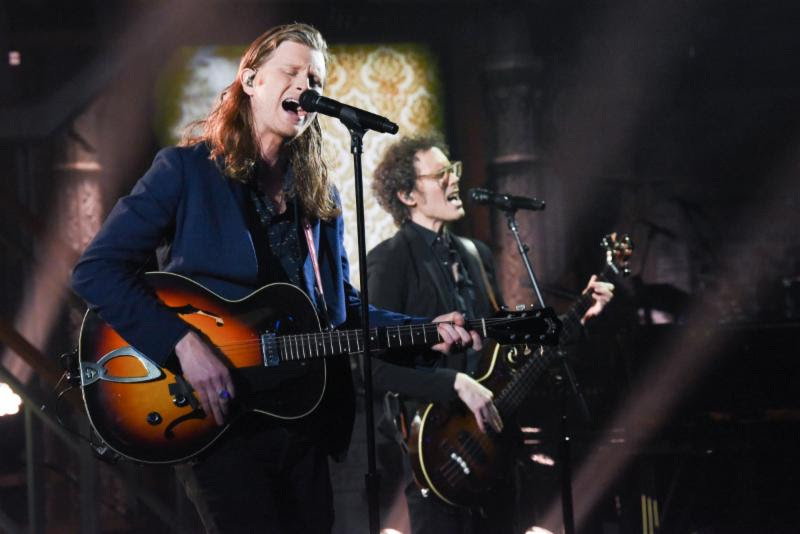 Jun 19 2017 Lumineers Share Live Video of Latest Single "Angela"
The Lumineers are currently on the road, opening up for U2 on a stadium tour and will soon play dates with Tom Petty and the Heartbreakers. The summer ends with three massive headlining shows at Fiddlers Green near the band’s home in Denver, CO (see full dates below). A friend and ally of the music community, MusiCares was established by theRecording Academy to safeguard the health and well-being of all music people. A four-star charity and safety net in times of need, MusiCares offers confidential preventative, recovery, and emergency programs to address financial, medical, and personal health issues. Through the generosity of our donors and volunteer professionals, our dedicated team works across the country to ensure the music community has the resources and support it needs. Today, The Lumineers release their acoustic rendition of Willie Nelson’s holiday classic “Pretty Paper“. All of the band’s proceeds from the first year of sales and streams will benefit the Brown Paper Bag Movement (BPBM), a grassroots program aimed at feeding and clothing the homeless. The band recently performed on 24 Hours of Reality: Protect Our Planet, Protect Ourselves, an annual broadcast hosted by former US Vice President Al Gore. The program visits countries around the world to hear from policymakers, thought leaders, and citizen activists on the front lines of climate change to discover how this crisis is impacting health worldwide. 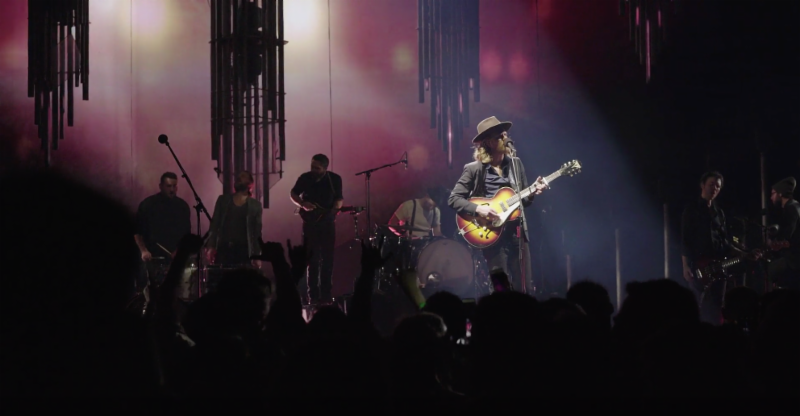 In early October, The Lumineers also shared a cover of Tom Petty’s “Walls” to benefit MusiCares®. The band opened up for Tom Petty and The Heartbreakers three times and performed “Walls” at the annual MusiCares® Person of the Year Gala in 2017, where Petty was the honoree. For information on The Lumineers, visit thelumineers.com. To find out more about BPBM, visit brownpaperbagmovement.org. Denver, Colorado’s The Lumineers released their eponymous debut album through Nashville’s Dualtone in 2012. The triple platinum album garnered two GRAMMY nominations and spawned the chart-topping platinum singles, “Ho Hey” and “Stubborn Love”. The band also served as Saturday Night Live‘s musical guest on January 19, 2013. The new album III is audacious: every note, every syllable, and every moment of silence in between is emotionally charged. The album is darker in tone than previous albums and is presented in three chapters, with each one centering on one main character from a fictitious family known as the Sparks, who span three generations in the album’s storyline. III‘s concept began while the band was writing in the Catskill mountains, where producer Simone Felice works. Mixing raw emotional themes with their ear-catching melodies, expressive vocals and trademark acoustic sound, III moves masterly in artistic directions not yet traveled by the band. The Lumineers have enjoyed substantial commercial success: their 2012 self-titled debut featured the hit single, “Ho Hey” and was certified triple-platinum in 2018, the same year their 2016 sophomore album, Cleopatra, was certified platinum and hit #1 on the Billboard Top 200. They’ve had 18 #1 hits on Triple A, Alternative and other radio charts, including “Ophelia” maintaining #1 for 13 weeks on Triple A. The Lumineers became only the second artist in history to hold the top slot on the AAA chart for that length of time. The band has sold out tours across the world, with over 300,000 tickets sold on 2017’s Cleopatra World Tour and ended with 27 sold out arena shows. The Lumineers have also supported icons and their musical heroes on the road, including Tom Petty and the Heartbreakers on his final tour and U2 on its Joshua Tree tour. This year, the band plans to tour across the U.S. and Europe, including their biggest ever UK shows at The O2 Arena London, Manchester Arena, The SSE Hydro Glasgow, and dates across Europe including 3Arena Dublin, Le Zénith Paris and Verti Music Hall Berlin, following a string of festival dates that include Hangout, Bonnaroo, Outside Lands, Woodstock and more. Last night, The Lumineers hit the stage at The Late Show With Stephen Colbert to deliver a captivating, intimate performance of their latest single “Gloria.” The new track is the first release from their forthcoming album III which comes out on September 13th via Dualtone (an Entertainment One Company) in the U.S. and Canada and Decca Records for the rest of the world. “Gloria,” according to lead vocalist Wesley Schultz, “is about love between an addict and her family.” As part of the set, the backdrop was complete with vintage patterns and found family footage. In addition to “Gloria,” The Lumineers debuted “Nightshade” as part of the Game of Thrones soundtrack last week. Starting in early summer, the two-time GRAMMY nominated band have plans to tour across the U.S. and Europe, including their biggest ever UK shows at The O2 Arena London, Manchester Arena, The SSE Hydro Glasgow, and dates across Europe including 3Arena Dublin, Le Zénith Paris and Verti Music Hall Berlin, following a string of festival dates that include Hangout, Bonnaroo, Outside Lands, Woodstock and more. For more information, visit thelumineers.com.